It's easy to make a simply satisfying side dish with this salad recipe featuring hardy winter greens. Escarole, radicchio, endive and onion are tossed together and then topped with golden kiwis and goat cheese. 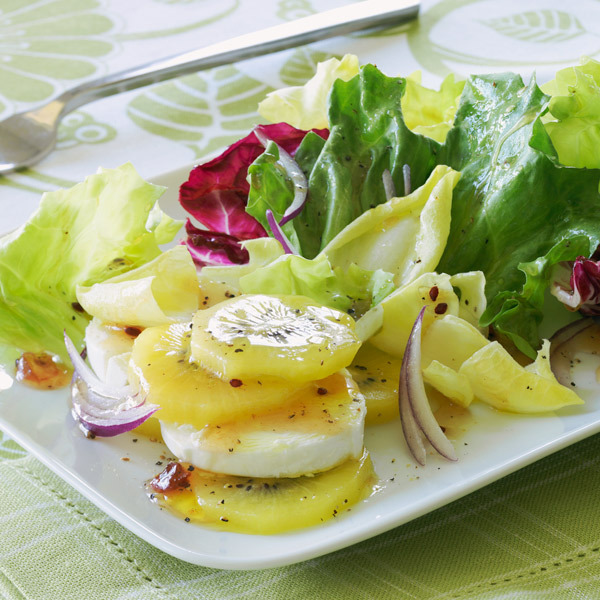 Drizzle with our homemade dressing that combines honey, currant jelly, vinegar and olive oil. Get ready for a lifted-fork salute from all of your guests! In small bowl, whisk together honey, currant jelly, vinegar, salt and pepper. Gradually whisk in oil until well combined. Toss together escarole, radicchio, endive and onion. Arrange greens on salad plates. Dividing evenly, arrange kiwis and goat cheese on each plate. Drizzle with dressing.